I've waited perhaps longer than necessary to do an update on my experience using the Shea Moisture Hair Color System in Reddish Blond. Check out my first post here. and out my Instagram for photos in the months following the color. My color has grown out quite a bit in the past few months. I've done a few henna treatments and they have helped to intensify the color. I'll continue doing the henna treatments, but I'm not sure when I'll do another chemical color. I love my color, I honestly do, but it's been so long since I've changed it that I'm now bored and tempted to do a rinse. Hopefully the next henna treatment will quell my urge to do something drastic. 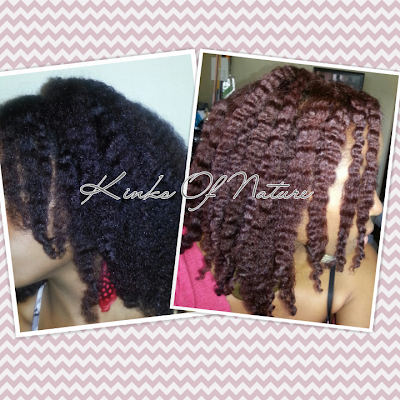 For maintenance, I wash at least once every 1-2 weeks and do a moisturizing deep conditioning treatment each time. The occasional henna or protein treatment is added to my routine once a month. I haven't gotten around to trimming my ends yet (terrible, I know), but I still moisturize and seal heavily to stem off any excessive breakage. I detangle only on wash days and do low manipulation styles. Single strand knots pop up as soon as I think I've gotten rid of them so I've given up on that cause. So far, I haven't experienced any real cons as a result of using the Shea Moisture Hair Color System. My hair is behaving just as it did before I colored. M y porosity might be lower, but I had low-medium porosity hair to start with so I don't mind. I haven't experienced any excessive shedding or breakage. When I had blond highlights previously, my hair would break off at the line of demarcation (end of new growth and start or chemical process). That hasn't happened to me with this product. I wouldn't mind using the Shea Moisture Hair Color System again if I wanted to use one of the colors they offer. Overall, I had a good experience with the color system, and it'd been over 2 years without any chemical processes, so I'm thankful I was able to do one without any major and/or noticeable damage.